It’s official: Today, New York City-based startup Magnify has acquired Waywire, the once-hyped startup founded by Senator-elect Cory Booker. That’s been widely expected ever since AllThingsD broke the news over the weekend that the deal would be done soon. In some ways, the matchup makes a lot of sense — both companies, after all, have the shared vision of empowering users to find, collect, and share videos with others. But in other ways, the tie-up of Waywire and Magnify shows a stark contrast in how the different companies hoped to achieve that vision. Waywire came rushing out of the gate with a bold plan to convert some of the toughest users to reach — millennials — into content curators. And it promised to do so thanks to a charismatic founder, Silicon Valley funding, and deals with big-name publishers. Magnify, meanwhile, has spent the last seven years slowly and steadily building its business, waiting for mass-market adoption of curation tools to truly take hold. For those of us who have been following the market since before YouTube, it’s a reminder of the good old days of web video, when there was a solid belief that anyone could become a video star. So how did these two companies end up together? Waywire launched with a grand vision of empowering millennials to collect, curate, and share videos with their friends. Founded by Newark Mayor and virtual superhero Cory Booker, along with Nathan Richardson and Sarah Ross, Waywire was meant to democratize communications through video, enabling anyone to become a virtual newscaster. The first version of Waywire’s public alpha enabled anyone to create a “wire” of the videos that interested them, and then comment, tag, or share with friends. It tied into social networks in the hope of creating a viral loop that would bring other users in. The technology potentially offered a new way for media companies to get their videos in front of an important younger demographic of viewers. Waywire sold a number of partners on the prospect, striking deals with more than 60 content providers before launch. Along the way, Waywire also picked up funding from a serious list of investors, making it clear that this was not some pet project from a high-rising political hopeful. While its $1.75 million seed round was modest, backers included First Round Capital, Eric Schmidt’s Innovation Endeavors, Troy Carter, Oprah Winfrey and LinkedIn’s Jeff Weiner. It was an ambitious plan from a larger-than-life public figure. But it never truly took shape, as almost from the start it faced technology issues and political pressure. 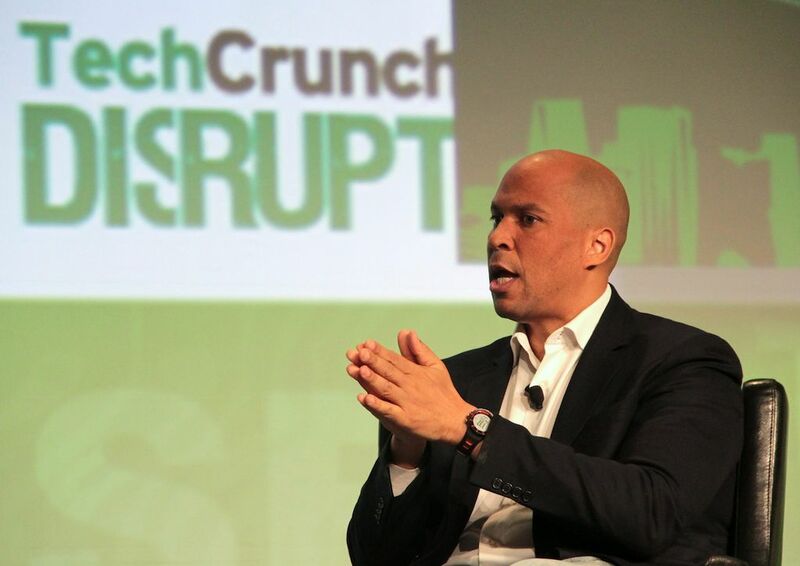 Unfortunately, Booker’s presence at Waywire cut both ways: While his participation clearly helped Waywire nab funding, partnerships, and buzz at launch, his ties to the company ended up becoming a political liability during his Senate run. Questions arose over potential conflicts of interest, an issue that was magnified, as it was trying to raise new funding from investors. With uncertainty looming around Booker’s role and press criticism arising over the company’s solicitation of new funding, Waywire was unable to raise the funds it needed to move forward. Meanwhile, being put under a microscope by the press was becoming a distraction for some of the team at Waywire, just as the company was attempting to pivot and relaunch its product. Meanwhile, Waywire was running out of money and options. All development had stopped. Employees were furloughed. Searching for new leadership and new funding, Waywire’s planned launch out of private beta was put on hold indefinitely. Enter Magnify. The New York City-based company might not seem like an obvious choice to buy out a company that’s gotten as much hype as Waywire. Founded in 2006 and backed by $5 million in venture financing, it’s quietly built out a niche for itself among enterprise clients looking for tools to host, store, manage, and deliver videos all in one platform. The company’s been at this for seven years, and it’s been a scrappy survivor through the boom and bust cycle that web video underwent in the late 2000s. It never hit the big time like YouTube, but then again, it also didn’t go bust like all the other YouTube competitors out there. Instead, it’s quietly — miraculously! — continued to operate with just a little capital raised, running lean and adding employees only as needed. Magnify might not be touting hockey-stick-like growth, but it’s producing revenue — at least enough to support a team of 15. But while it’s created a solid business, Magnify CEO Steve Rosenbaum still believes that the much bigger market opportunity still lies ahead. If anything, his vision of a “Curation Nation” — which is also the title of his book on the topic — was way ahead of the curve. So far ahead, in fact, that some people (like me) were beginning to wonder if that future would ever come. When we thought about how much overlap there was between the companies… it was like 70 percent. 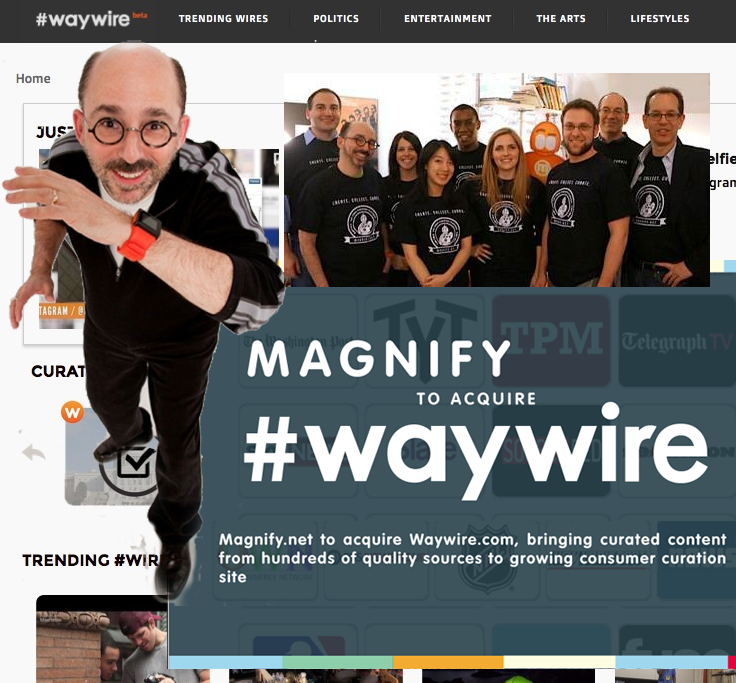 Talks between Magnify and Waywire began in early February of this year. At first, however, the companies were just talking about what kind of synergies they might be able to realize through a partnership, not an acquisition. As Waywire was considering how it would move forward, Magnify’s pitch was simple: It had already done the hard work of creating a scalable platform for video curation. Why should Waywire rebuild the wheel when it could use Magnify’s platform instead? Regardless, those talks didn’t go very far, and Waywire continued to move forward with its plan to secure new funding and relaunch its own video curation product. But the two firms would revisit the discussions as Waywire began to look for other strategic options. There’s good reason to believe that consumer appetite for curation tools might finally be taking hold — if nothing else, Pinterest has shown that there are many consumers with a wild appetite for creating collections of content online. It’s yet to be seen, however, if that appetite extends to video. Magnify will soon find out, as it has already relaunched the Waywire site using its own backend technology. It might not have the same flash that the original Waywire had, but at least it’s functional. The new site launched in 10 days, and is just the start of what Magnify hopes to do with Waywire. Rosenbaum says the company will continue to roll out features to make it more intuitive and consumer-centric over time, but the important thing was to get something up that worked. Magnify inherited a number of content partners through the deal. The Waywire site has more than 60 feeds of professional content listed now, and that will increase to more than 100 over the coming weeks, according to Rosenbaum. But while having lots of content will help it attract viewers, it’s going to be up to users to keep their peers coming back. After all, that’s what curation is all about. “Web video today is like going on a treasure hunt without a map,” Rosenbaum says. With this deal, he thinks Waywire may finally live up to its promise to help you find what you’re looking for.